Carrier testing made easy for you and your patients. Eugene offers at-home carrier testing, online genetic counselling & seamless integration with your practice. Simple sample collection, timely turnaround, empathetic experts and the latest genetic testing methods. It's all a part of what we do. Genetic counselling: Pre and post-test genetic counselling is included for every patient with before, during and after hour secure video consultations. Lab results: Internationally accredited, medically actionable. Methodology: Full-gene sequencing and deletion / duplication analysis using next-generation sequencing technology. You refer a patient, we take care of the rest. We think genetic testing should be a convenient, compassionate and accessible experience. That’s why we created Eugene. We make it easy for you to offer an end-to-end clinical grade genetic testing and genetic counselling service to your patients. We provide an end-to-end service Australia and New Zealand wide. Every patient gets pre & post test video counselling from qualified GCs. You get accredited lab results, Eugene reports and fully informed patients. Send referrals and get reports within your clinical systems and workflow. What is Eugene's carrier testing service? Comprehensive reproductive genetic carrier screening & counselling. Eugene's carrier screening test helps identify if your patients are at risk of having a child with a serious, relevant or clinically actionable condition. Our genetic counsellors take the time to get to know your patients and provide the most relevant testing experience. Pre and post-test counselling is included for every patient with before, during and after hour secure video consultations. A testing panel of 288+ serious and actionable diseases. We use an Invitae panel that includes 288+ recessive and x-linked conditions including Cystic Fibrosis, Spinal Muscular Atrophy, Fragile X syndrome, Thalassemia, and Tay-Sachs disease. When combined, the average risk of having a child with one of these diseases is higher than the risk of having a child with Down syndrome. Diseases that impact a child's life expectancy or development & have limited treatment — where the knowledge of your risk can give you options. Our test includes many serious diseases that are more common in different ethnic communities and are often excluded in industry standard tests. 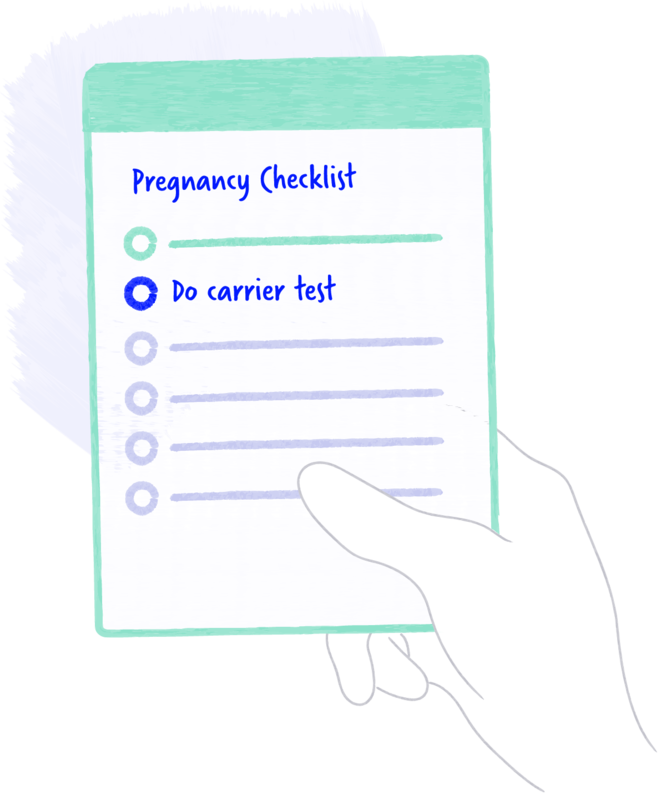 Information on carrier screening should be offered to all women planning a pregnancy or in the first trimester of pregnancy. An increasingly routine practice in preconception and prenatal care. Everyone wants a healthy baby. Offering carrier screening to every patient, regardless of their ethnicity, age or family history, means better surveillance for more serious conditions. Knowing any risks in advance can help your patients make more informed reproductive choices; and if necessary, significantly reduce the risk of passing on a disease. With both the RACGP and RANZCOG recommending that providers offer carrier screening to their patients who are family planning, the impetus to inform patients about carrier screening has never been greater. of people screened by Eugene are found to be carriers of at least one disease. of babies born with an inherited genetic disease had no family history of it. of carrier couples are missed when only screened for CF and SMA3. Simple, transparent pricing with no surprises. We also offer interest-free financing1 from $40 a month to make things easier for your patients. Includes the test for one person, pre and post-test counselling, taxes, shipping, handling, and everything else. Includes the test for two people, pre and post-test counselling, taxes, shipping, handling, and everything else. We're making genetic testing easy for you and your patients. We're a team of clincians, genetic counsellors, technologists and designers working to make genetic testing accessible, affordable and convenenient. We believe that a compassionate, emotionally supportive, and culturally sensitive environment is super important in making these services accessible to everyone. We embrace the science and ethics behind genetic testing to only offer your patients products that we would use ourselves, and recommend to loved ones. These are products that can provide people with relevant information so they can make important health choices. I’m an experienced entrepreneur & product designer that loves to build products that takes something confusing (like genetics) and makes it easy to approach and understand. I’m a bit from all over the place, and I’ve lived and worked in Australia, US, Latin America, Middle East & India. I speak 4 languages and I'm also a bit obsessed with Burning Man. I started Eugene because unequal health outcomes for people, especially the ones within the same healthcare system, is an infuriating inequity I could no longer stand by. Not to mention, the lack of diversity in genetic data means that as a minority, I’ll personally be on the receiving end of that inequity sooo I figured that I better get to work. I’m a Genetic Counsellor and I’ve spent the past 10 years working in a clinical setting, providing ethical & clinically relevant genetic testing in public and private health systems, and supporting people through education and psychosocial support at every stage of life from pregnancy, birth and planning for death. David trained in paediatrics and genetics at the Royal Children’s Hospital before completing a PhD in Chromosome Biology at the Murdoch Children’s Research Institute. In 2016 he was appointed to the Galli Chair in Developmental Medicine at the University of Melbourne, prior to which he was Director of Victorian Clinical Genetics Services. His current research focuses on the genetics of intellectual disability, the translation of new genetic technologies into clinical practice and the identification of genes for rare syndromes. David is passionate about raising awareness about genetic conditions and has been integral in the development and implementation of many population screening programs. I am the keeper of keys and code at Eugene. An experienced technologist and critical thinker I have a proven ability to understand new domains, pinpoint real world problems and create technical solutions. I have a collaborative leadership style and I believe in the empowerment and inclusion of everyone on the team. I thrive in the quick pace and commitment of start-ups and high performing teams where I can apply a range of skills. I am committed to diversity and equal access to technology, and encourage everyone I can to pursue a career in this industry as I have found it extremely rewarding. My current interests are all things security, functional programming and serverless architecture. It takes two minutes to get started.